I watched part of it before going to bed a few nights ago, it wwas on AMC. I think it's a classic comedy. I can't believe that was Dolly Parton's first acting gig. She is a natural. I loved the part when Lily Tomlin pretended to be a doctor, and got pulled over by the cop. 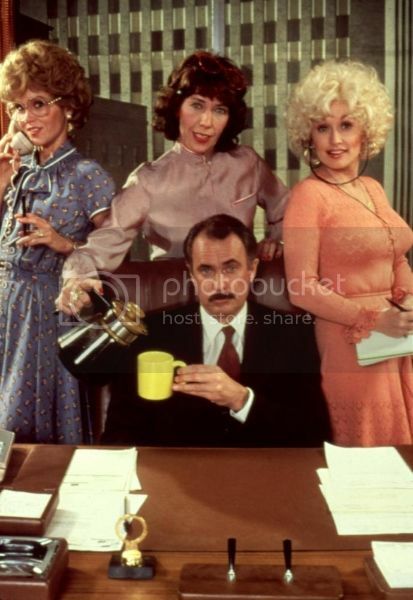 There are still bosses out there like Dabney Coleman- some men are just pigs and will never learn. I had an assistant manager at a store I worked at that was like him. Anytime he knew I was working, he'd come by my dept. just when I happened to be setting up a new table of shirts or something and I'd be bent over the tables- he was disgusting. We called him Boss Hogg cuz he looked like him but with glasses. Oh my god, Frank Hart was a Human Resources nightmare! I love this movie but I cringe everytime I watch it. I work in HR and Franklin Hart would be out the door so fast! It's insane how he would call them "girls" all the time, proposition Dorilee and make the whole office such a hostile environment! I also couldn't stand Roz. What a snoopervisor! There is someone like this where I work now and it's just amazing to me. All that being said, this movie is so much fun to watch, especially when they turn it all around. I love the end when you see the office and it's got so much more color and couches here and there and people are allowed to have plants and personal items on their desk. Those kinds of little perks are so important. I worked in corporate HR, for a global company and it was very much a cold, sterile environment. I tried to reverse that but what the higher ups say, goes unfortunately. I should have chained up my boss like Violet, Dorilee and Judy did! This is truly a classic that belongs in any 80s collection. Hands down very funny and creative! This was insanely succesful at the box office (10 million-> 103 million), tv-series (any good?) and musicals followed. The theme song went to number one on the Billboard hot 100. Wow, I haven't seen this one in a long time. Not sure if I even own it, but If I do -- this is getting watched tonight. "You're a sexist egotistical lying hypocritical bigot!"